Ram Question for 2017 27" I-Mac submitted 1 year ago by Whomperz82 So I just pulled the trigger on upgrading my 2011 21" i5 to the 2017 27" i7 and naturally would like to upgrade the ram from the default 8gb to 32gb (2x16) without paying apples astronomical prices. I know that earlier iMacs could be end-user upgraded to add more memory. I was wondering if that is still the case with the models they announced yesterday, both for the 21" and the 27". I was wondering if that is still the case with the models they announced yesterday, both for the 21" and the 27". 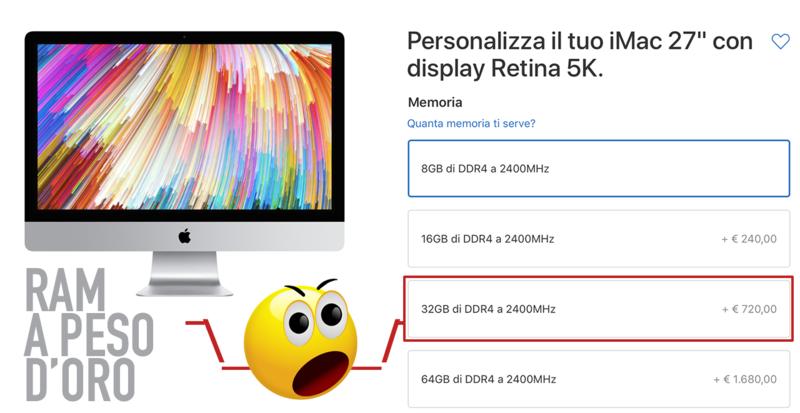 Apple also now offers up to 64GB of memory in its 2017 27-inch iMac, however the company only offers configurations up to 32GB memory in the least-expensive base 27-inch model with a 3.4GHz quad-core Intel Core i5 processor.